(4) 12AX7, (2) 6V6GT or (2) 6L6GC, and (1) GZ34. Bass, Middle, Treble and RAW controls plus BRIGHT switch. All-tube driven, 3-spring medium delay Accutronics tank in padded reverb bag with shielded cables and TONE control. Accomplice features an 18-gauge non magnetic stainless-steel chassis with TIG welded corners, and the Accomplice Jr. features an aluminum chassis. Cool and quiet running Allen TP40D 180ma power transformer, TO35MT upgrade paper bobbin interleaved winding output transformer, TR reverb transformer and TC choke are all U.S. made. See the TRANSFORMERS page for details. Optional 40W transformer set features the TO40MT output transformer and larger TRCH choke (available for $25). 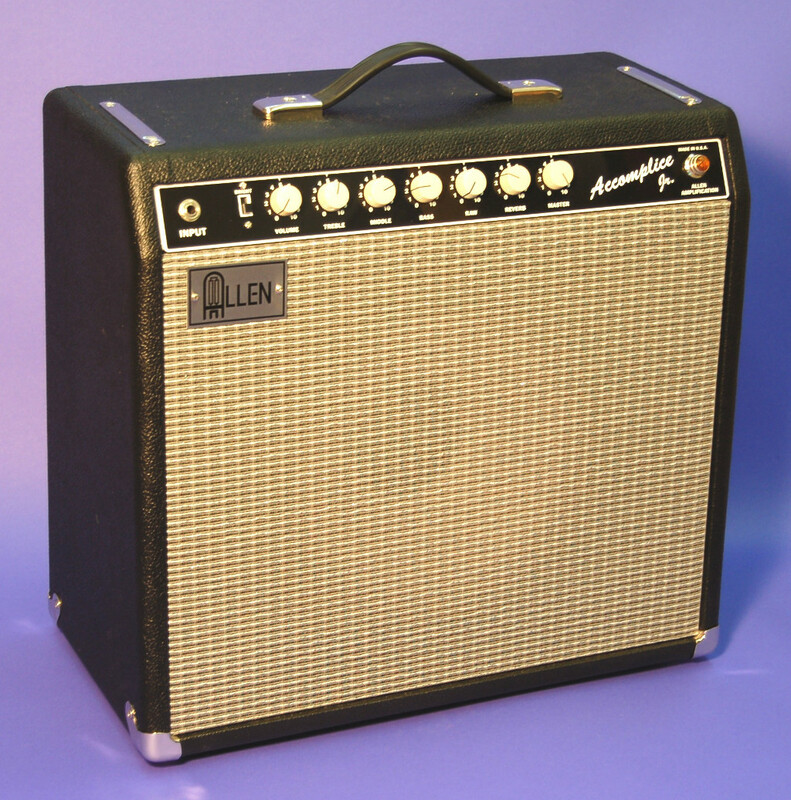 Design is loosely based on the blackface Fender Deluxe Reverb but without a normal channel or vibrato function. Design is enhanced with Bright switch, middle control, RAW control, Reverb TONE control, master volume, impedance switch, and bias measurement jacks. 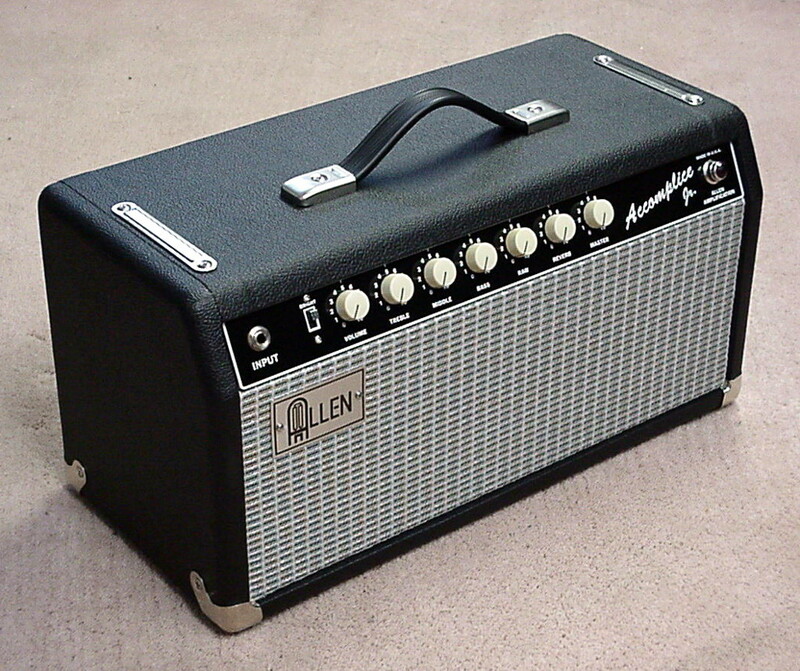 Finger-jointed pine with black Tolex covering, black/white/silver sparkle grill cloth, Tolex covered rear screw-on panels, rubber feet, black rubber (steel reinforced) carrying handle with chrome caps and screws. Rear-panel bias measurement jacks, RAW mid/gain boost control, bright switch, impedance switch, extension speaker jack, and TONE control for the reverb. 1x12 Combo - 22"W x 18"H x 10"D, 42 lbs. 2x10 Combo - 22"W x 20"H x 10"D, 50 lbs. 1x15 Combo - 22"W x 20"H x 10"D, 49 lbs. Head - 22"W x 10"H x 10"D, 30 lbs. Accomplice Jr. - same power and features (less the reverb tone control and the impedance switch) in a smaller chassis. The 1x10 combo packs 35W in 35lbs with 6L6 power tubes. 6V6s may also be used for 22W. Eminence Copperhead 10" speaker and long Accutronics reverb tank for big amp tone. Head, 1x10 combo, or 20" tall 1x12 combo. Also available in kit form. 1x10 Combo - 20"W x 16"H x 9-1/4"D, 34 lbs. 1x12 Combo - 20"W x 20"H x 9-1/4"D, 38 lbs. Head - 20"W x 9"H x 9-1/4"D, 25 lbs. 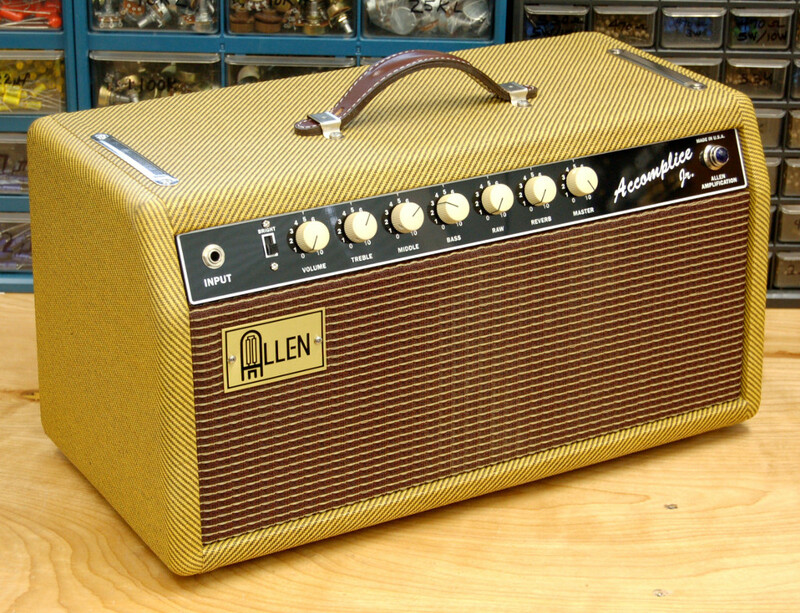 Click here to read a review (pdf) of the Accomplice Jr. from the June 2006 issue of Vintage Guitar Magazine. 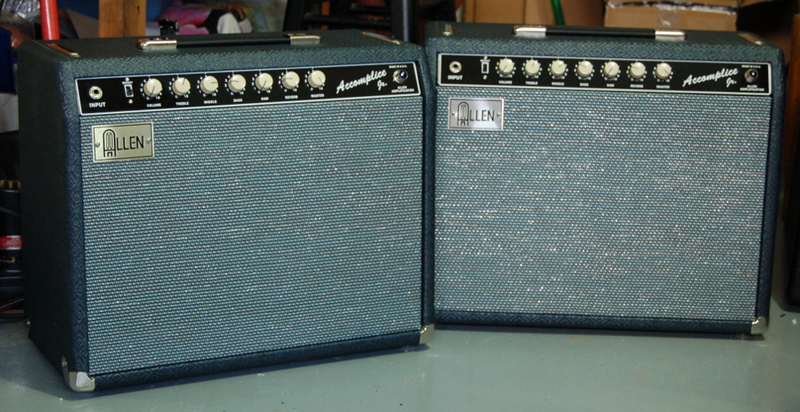 Accomplice 1x12, 6L6s, and a Red, White, and Blues speaker. A Route 66 overdrive pedal was used on a few of the heavier clips as noted. 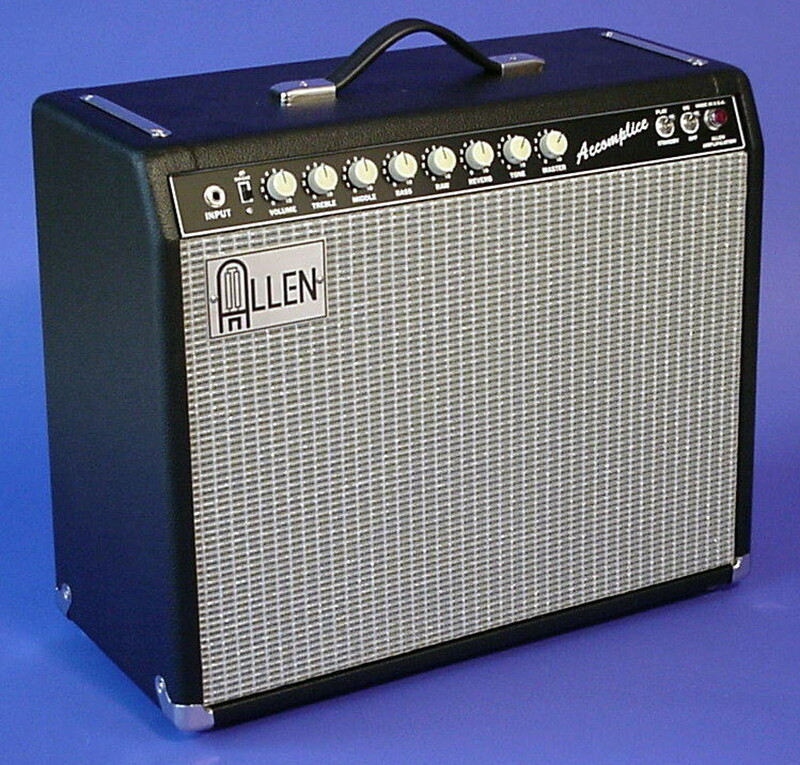 Tony Sims checks out the Allen Accomplice amp.